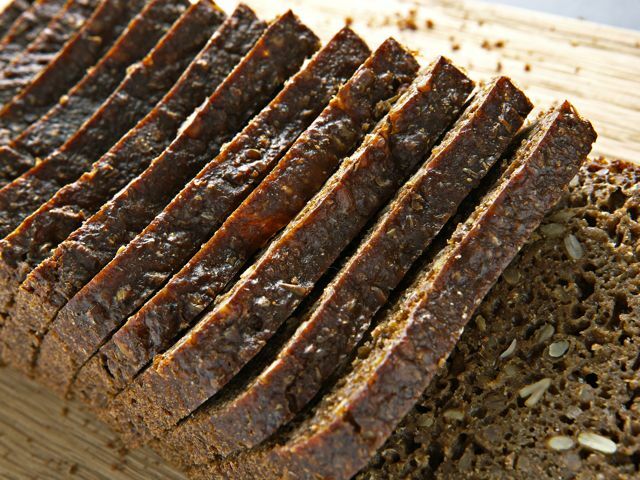 Baking this rich, dark bread that forms the basis of all smørrebrød dishes may take some time to master. But once you’ve got the feel for it, you’ll be hooked. This recipe comes from Danish deli owner Adam Aamann. In a large bowl, stir all of the Day One ingredients together. Cover the bowl with a wet cloth and set it aside for 24 hours. On the second day, add the Day Two ingredients (except the vegetable oil) and knead them into the Day One mixture for 10 minutes. The dough should now have the thickness of heavy mud. Rub a little vegetable oil inside two large loaf pans and divide the dough between the two pans. Leave to rise for 4 to 6 hours. Preheat the oven to 350 degrees F, then bake the two loaves of bread for 1 hour and 45 minutes. Remove the bread from the pans and place the hot loaves directly on the oven rack; continue to bake for another 15 minutes to develop a nice crust. Let the loaves cool completely. For smørrebrød, cut thin slices of less than ¼-inch thick.